There exist a variety of schools of Karate. Kyokushin Karate is the name which refers to the school of Karate founded by Sensei Masutatsu Oyama. Kyokushin Karate was created by Sensei Masutatsu Oyama adapting the techniques of combat sports and bujutsu which he thought were best from around the world, combined with the Shotokan Ryu and Gojyu Ryu styles of Karate. It is said that when he was training, Sensei Masutatsu Oyama experienced western boxing, Muay Thai, Chinese martial arts, Japanese jujitsu and judo, among others. Also, at the outset of Kyokushin Karate, there were highly lethal techniques being practiced such as knees and Muay Thay krinch and elbow strikes. Furthermore, looking at the written works left behind by Senshi Matsuatsu Ooyama, it is established that these techniques were influenced by Okinawan old school of Karate and Japanese jujitsu, etc. In other wards the original concept of Kyokushin Karate is exactly the same as that of Freestyle Karate.The “freestyle Karate” we speak of here is to subsume and fuse the technique of all schools. That is to say that this is the meaning of “freestyle Karate”. At the outset of Kyokushin Karate, it adopted the direct strike system of kumite and bout methods, and championed itself as “dynamic Karate”. I think that the meaning of this is an expression that, just like with the mechanisms of life, to adapt to change without giving up while continuing to make the best use of oneself. In recent times, traditional techniques are becoming a shell of their former selves, and a variety of traditional techniques are becoming extinct.For example, such traditional Karate techniques as “straight punch”, “front kick”, and “kake”, which are seen in traditional Karate, are not often seen in modern Karate. I believe it has become this way because of a biased world image (the image of Karate) which makes the match rules absolute,and closed tovariations of technique. The true essence of what Kyokushin Karate has given birth to and developed is the presentation of a new world image. It is one which understands the mind of the times. I believe that budo is the path of protecting oneself from one’s own losses, and to cause the opponent to lose his or her fighting spirit (a path for attempting the coexistence of oneself and others). In other words, if you define budo it would be “budo is a path for attempting the coexistence of oneself and others through bujutsu”. To get back on topic, Kyokushin Karate practitioners have, by adopting a direct strike system, come to think about “how to defeat an opponent”. I think this is the key of Kyokushin Karate’s development. This is the way of dynamic Karate. However, this ideal is slowly breaking down. This is because Kyokushin Karate practitioners have gone on to become controlled by thoughts like “matches are everything” and “how should I fight to get the referee to give me a flag?”Needless to say, matches are not all bad, and neither were all the people thinking like that. What was wrong was that no one tried to become aware of or consider such tendencies. And the fact that, even if they were aware, they were not able to raise an objection. To put it bluntly, people’s awareness was sealed off from within by a dogma which said that “protecting the system is a good thing”. I will pursue this ideal. And I will continue to believe in the potential of Kyokushin Karate. “Freestyle Karate” specifically IBMA-Kyokushin-Kai Karate-do is a Karate which mutually operates “traditional techniques”, “kumite techniques”, and “comptition”, and supplements these together. In other words, it examines and preserves the traditional Karate techniques, and fuses them into the kumite techniques which I have additionally established. 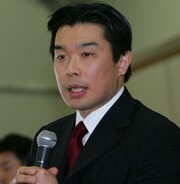 Also, through the establishment of a new budo sport (FK Project), it will examine techniques from all combat sports and establish a place of experimentation where new techniques can be created, as was the case with the original Kyokushin Karate. Lastly, I believe that Karate and sports are also forms of art. And I believe that art is rooted in the body and spirit of humans, and is necessary for the restoration of humannature. “Freestyle Karate” aims for the rediscovery of human nature through training and matches. It also at the same time aims to bring back the creativity and dynamism to Kyokushin Karate. Our forefathers named the bujutsu which emerged from Okinawa “Karate”. The word “kue” is grounded in the words of Buddhism. And Karate is translated into English as “empty hands”. I believe that “kue (empty) “correctly means to have an open mind which is always open to the outside, and at the same time to cultivate one’s inside. Please join me in my ongoing study of IBMA-Kyokushin-Kai Karate-do, a Karate-do which is both old and new.